Less crowded than the Shoshone and Grizzly Creek runs. Some splashy waves including the Glenwood whitewater park and South Canyon rapid. 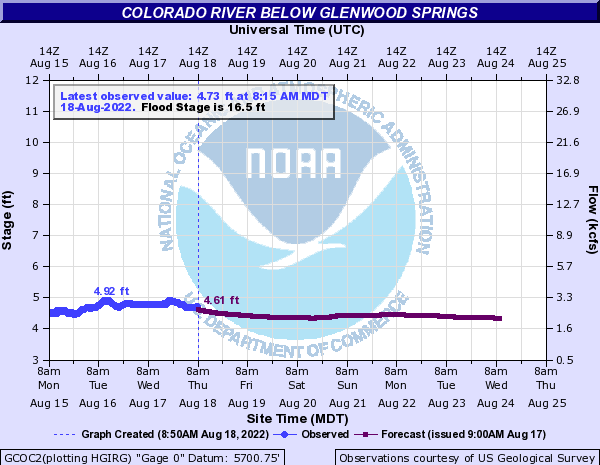 Primary Gauge COLORADO RIVER BELOW GLENWOOD SPRINGS, CO.
Good access for all vehicles on city owned concrete ramp. BLM managed access. Not open year-round, usually April to snow. Sandy ramp with a concrete pad-4WD recommended. BLM recreation area. Sandy steep ramp with a concrete pad-4WD recommended. Good parking, no fee. Closed seasonally. Usually open April through November.